Collections at the Science Museum of Minnesota are acquired in many ways: field research, exchanges with other institutions, donations, and purchases are among the most common. 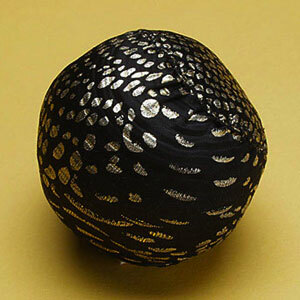 This Hmong cloth ball however, has a more uncommon source. This item was found in January of 2001 by Richard Oehlenschlager, Assistant Curator in our Biology Department, as it emerged from a melting snow bank on the museum's lower grounds near the Mississippi River. Anthropology staff recognized it as a ball used for the ball toss game, a traditional courtship game played at Hmong New Year celebrations. It was assumed to have come from the November 2000 New Year event held across the street from the museum at River Centre, and it was added to our Hmong collection as a "surface find". As in Laos, ball toss remains a popular activity at Hmong New Year (Noj peb cog), which in Minnesota is held Thanksgiving weekend. It provides an opportunity for singles to get acquainted and do a little flirting. Young men and women stand in separate lines and each of the opposing pairs tosses a ball back and forth. By tradition, a missed catch requires the player to forfeit an item of clothing or jewelry. These forfeits are then recovered later by singing a love song - one item per song, thus creating yet another excuse to get together. The Hmong New Year celebration are heald every year in downtown St. Paul in November.